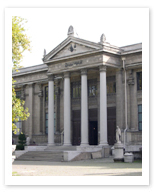 Home to one of the richest collections of Classical articacts in the world, the Archaeological Museum in Istanbul is well worth a visit, and also contains important treasures from pre-Classical times. The museum houses 20 separate galleries, so plan on taking some time to view the pieces of history on display here, spanning over 5,000 years. Especially worth examining are the sarcophogi, with friezes depicting Alexander the Great, an inspiring gallery on “Istanbul Through the Ages,” and the Treaty of Kadesh- the original tablet containing the words of the world’s oldest surviving peace treaty, signed in 1269 BC by the Egyptians and Hittites, with clauses for a cessation of hostilities, and for the return of political refugees.